Earlier this year, I joined the Foot2Freestyle block swap organized by Kate and Sue. 12 quilters have picked one or more colours and each month we’re making three 12.5’’ blocks in the colours chosen by that month’s quilter. Each person ends up with 36 blocks that she can then turn into a quilt or something else. Apart from the colours, the design of the blocks is completely free. I thought it would be fun to join since I enjoy doing patchwork but don’t really do it all that often. In June we sent out our first blocks to Esther who had chosen mustard, jadeite and coral with a white or cream background. This is a colour scheme that does not come natural to me and I found it difficult to judge whether the fabrics that I put together really worked. In the end I decided to add a dark blue fabric to all the blocks to make it work for me. To give some cohesion to my blocks I repeated a couple fabrics in all three blocks and some in two blocks since a colour is less likely to look out of place when it is repeated. The first block that I finished is the Garfunkel foundation paper piecing block from 627Handworks. 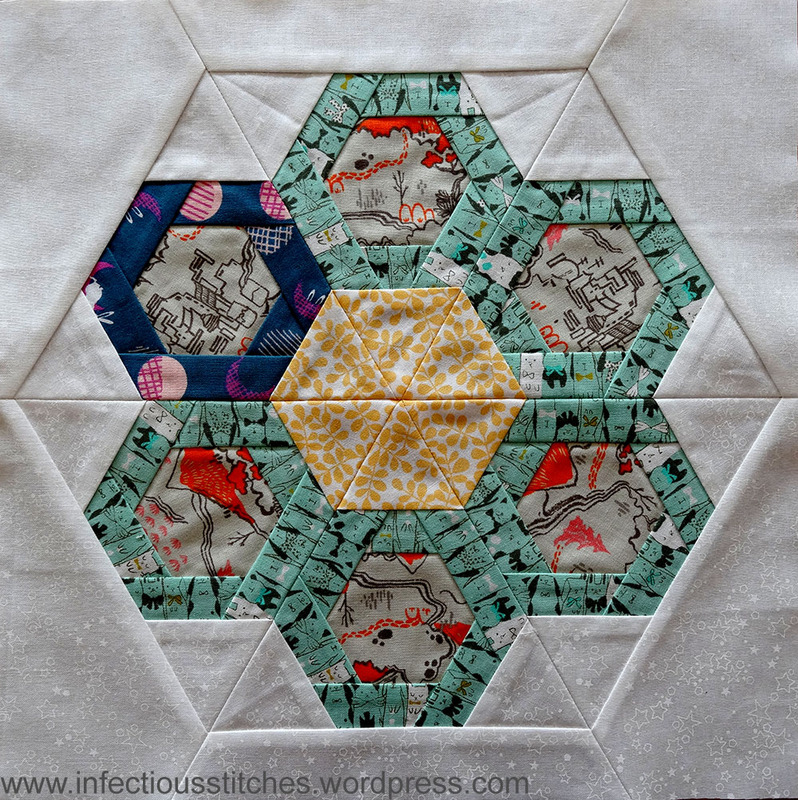 My love for asymmetry already seeps through in this block as I couldn’t resist making one of the hexagons a different colour. I feel this adds some interest. This is one of my favourite quilting books. The second block that I made was actually the first one that I started. I intended to make the Marley foundation paper piecing block from 627Handworks but after I had sewn the first quarter I realized the printer had not printed the pieces correctly and I would not end up with a nice 12.5’’ square block. I quite liked what I had made so far though, so I put it aside for a bit and made the Garfunkel block instead. 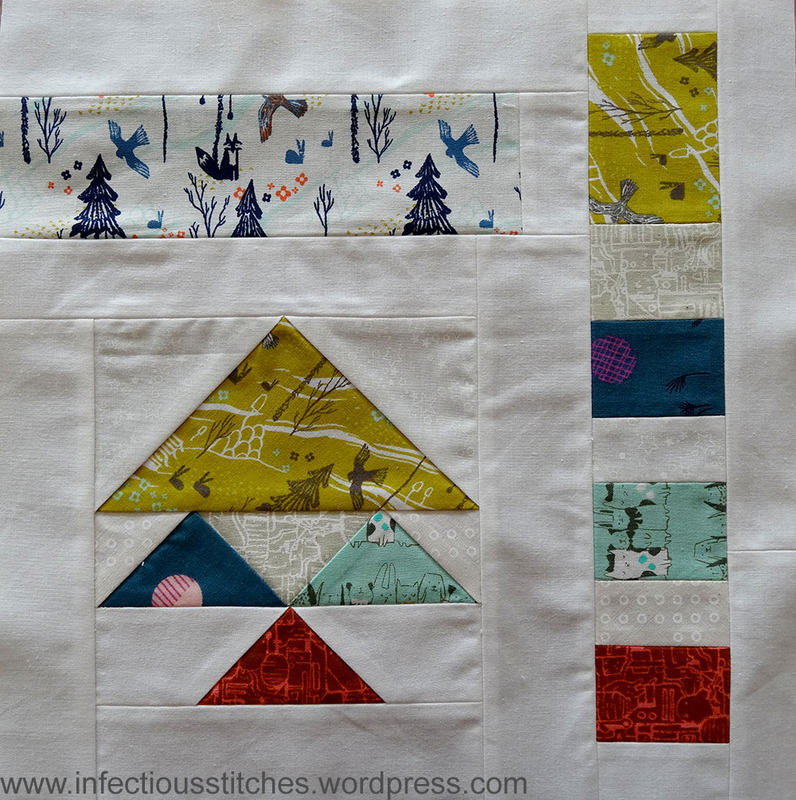 Looking through Esther’s blog I decided that she could probably deal with some non-traditional improvisational piecing and I started to use the “what if” method. 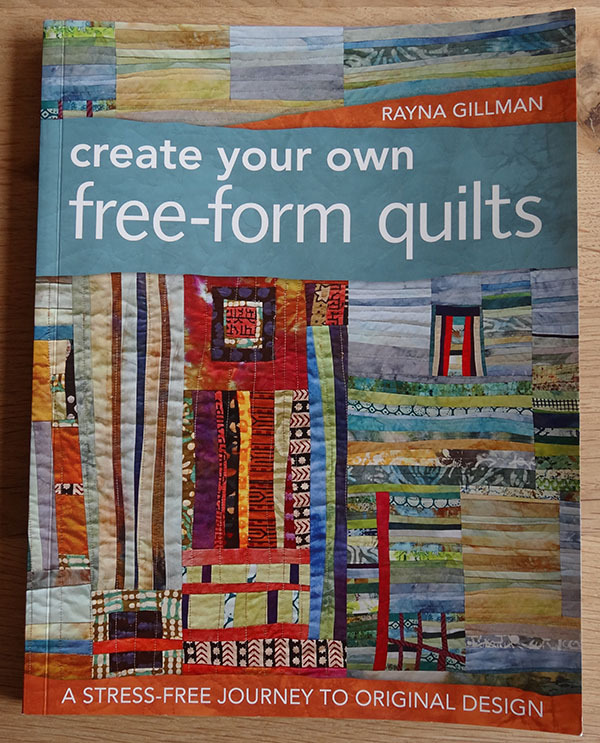 This is something I picked up from Rayna Gillman’s book “create your own free-form quilts”. I find this a very inspirational book and it contains pictures of some really amazing quilts. Basically, as you are making a quilt you should continually ask yourself the question “What if I did ….?”. In this case I started with the Marley block piece I already had (the triangles) and wondered what it would look like if I pieced a strip using the same fabrics. After piecing I tried it in different positions and decided it looked best on the right side with some white negative space in between the triangles and the strip. I decided to add white fabric all around the triangles, but the block still needed something in the upper left corner. I looked through my fabrics and after auditioning several options I picked the one that’s in the block and also decided it would look best with some white fabric separating it from the pieced strip on the right and the top of the block. I just love that little fox that’s almost in the centre of this fabric! This is my favourite out of the three blocks I made this month. Marley block with improvisational piecing. I think this blocks represents my style best. To make sure the second block wasn’t the only improvisationally pieced one that Esther received I continued the “What if?” strategy for my third block. 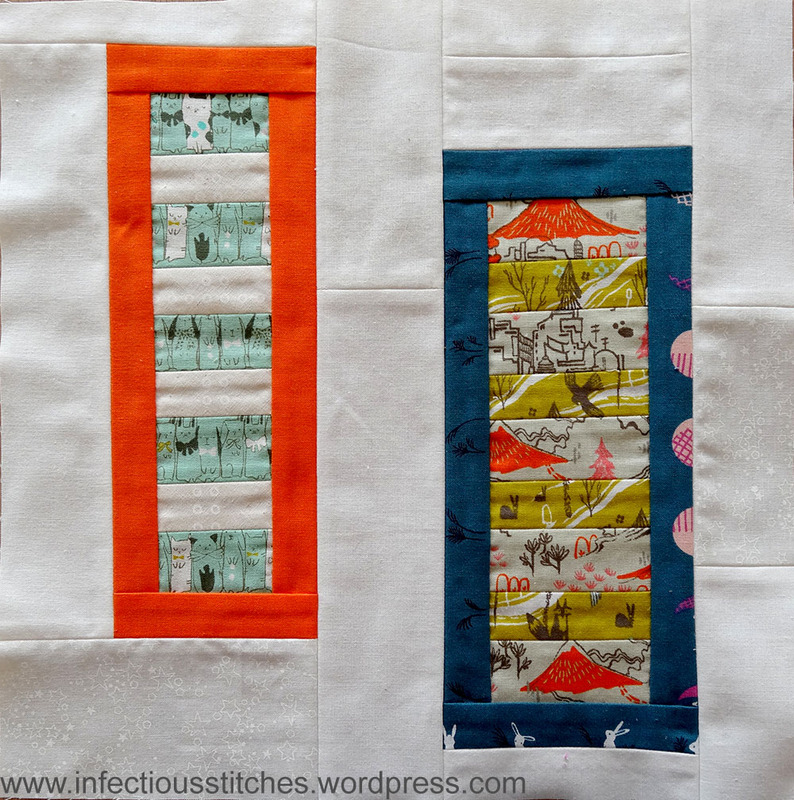 I started out by piecing some small pieces of cat fabric left over from the Garfunkel block into a strip. Then I thought “What if I add an orange border?”. Followed by “What if I make another strip set using different fabrics and add a border to that strip set as well?”. After trying several different positions for the two pieces I decided they looked best floating apart in the background with one higher than the other. If you are curious to see what the other ladies have made so far, you can have a look here, where the blocks for each month are shown. Fabrics for these blocks came from Cotton+Steel Tokyo Train ride by Sarah Watts and Mochi by Rashida Coleman-Hale, Moda Sunny side by Kate Spain, RJR fabrics Basically Patrick by Patrick Lose and Kona cotton. Oh, and I have finished garment to show you too! I just need to take some pictures and write a post.